This section provides a tutorial example on how to create a simple plain text editor pane with a call of setText() to set initial text content. 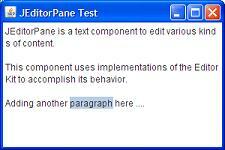 setContentType("text/plain") - Setting the content type to be plain text. setText(text) - Setting the initial text content. "JEditorPane is a text component to edit various kinds of"
+" content.\n\nThis component uses implementations of the"
If you run this example, you will see a text editor pane displayed with the initial text content.